We've embraced new technologies to offer services the other guys don't. Our wide range of speciality screen prints include more than spot colour printing. Learn more about the many services and products we offer below. Utilising our advanced screen printing technology, we deliver outstanding quality every time, whether it's a large or a small print order. Our ten colour automated carousel enables us to screen print multi colour designs in the finest detail at a rate of 4 seconds per t-shirt. That's 900 per hour! Some may say plastisol ink plays second fiddle to its fancy new brother; discharge ink. However, it still remains a stalwart in the industry. 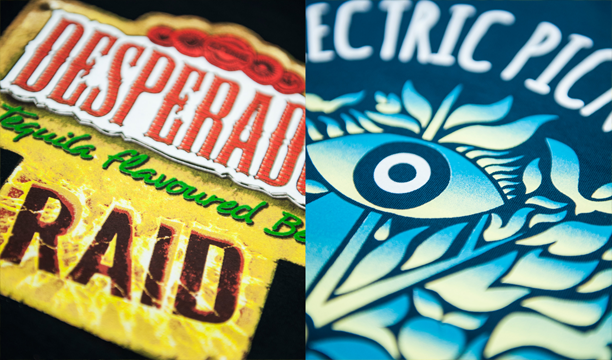 For bright prints on all coloured t-shirts, the plastisol ink is king and when it comes to making your design pop, it can't be beaten. If you require a 100% pantone colour match for your logo or design we can achieve this with a plastisol ink screen print that will stand the test of time. Our max sized garment print is A3, 290mm (W) x 420mm (H], we know that isn't enough for some of you so we also offer oversized printing, which we affectionately call Jumbo. Printing with the grand dimensions of 380mm x 600mm. This covers the whole front of the t-shirt. Using our soft feel discharge ink we can print over seams and stitching without blurring the image. A sure-fire combo to ensure your t-shirt gets noticed. Using special inks and techniques can give your designs another layer of interest and a unique twist to make your t-shirt stand out from the crowd. There are numerous effects possible, from metallic and neon inks to glow in the dark and foil printing for that high impact 'bling' look. Get in touch if you want to discuss some more options. 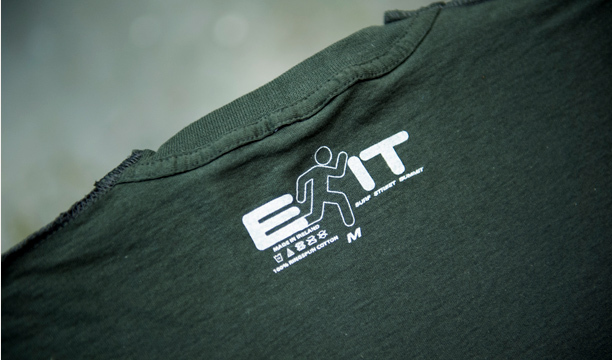 If you are looking to brand your own t-shirts for retail, no better way than a nape print with your own customised logo. Some like to brandish it outside so it can be seen and some prefer a more subtle stamp on the inside of the tee. Four colour process screen printing otherwise known as CMYK is best suited to printing full colour photographic designs on white tees. We use four screens; Cyan, Magenta, Yellow and Black. The ink is passed through very fine halftones that overlap on the t-shirt to achieve perfect tones and gradients! 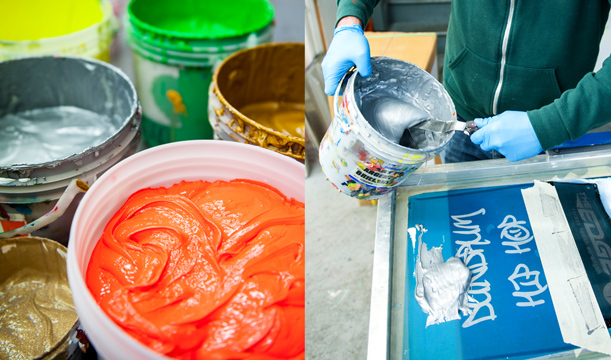 Simulated process printing is used to screen print full colour images onto dark tees. It's trickier than four colour process on white shirts. We use from 6 to 10 screens depending on how detailed the image is. We mix all of our inks in house. So if your artwork has pantone references we'll mix a recipe to suit. Plastisol inks are the most accurate for matching exact colours. Alternatively if you need a little help choosing colours get in touch and find out more about our stock inks. Using the most advanced embroidery technology in the world, we produce the finest stitched artwork the industry has to offer. With a wide range of thread colours available, we can get your logo spot on. Be it business or casual wear, our embroidery can bring artwork to life, giving any garment a professional feel that's sure to make the right impression. 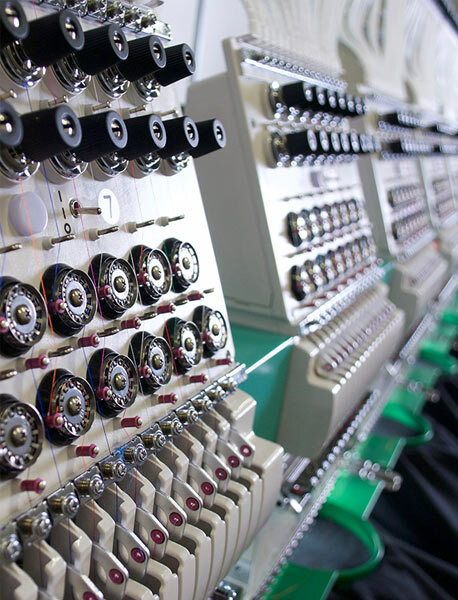 We're packing heavy artillery with the TAJIMA TFMX-IIC1502, a state of the art multi-head embroidery machine. We even had to knock a wall down for this baby! Unlike screen printing the cost does not go up when you add more colours to an embroidery job. Your designer probably won't ever forgive us for saying that. We have sent many of our printed products far and wide. We offer shipping worldwide with UPS, so you can track your deliveries online. We are now proud to offer bespoke packaging as an exciting new service. Smart, customised and branded packaging can add heaps of value to your products. Our minimum order is just ten pieces. Absolutely, and at no additional cost. Can you match pantone references? How close to the edge of the t-shirt can you print? This depends on the ink you choose, plastisol has to be kept 3cm from the seam. But discharge can be printed over seams no problem. What's the maximum printing size available for cotton bags? Our max print for cotton bags is 26cm (W) x 33cm (H). How are you guys so amazing? We don't know, it could be how we were raised or it could just be good genes, the nature vs nurture debate rages on.